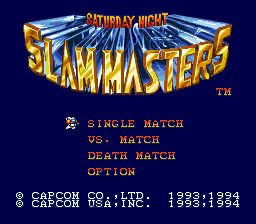 Play Saturday Night Slam Masters Now! It's Saturday night, and the Slam Masters have arrived! Ten of the biggest and beefiest wrestlers ever to step into the ring have gathered for one bone-crushing, back-breaking tournament where there are NO RULES! Being a wrestling fan myself, I was definitely taken into Saturday Night Slam Masters. It takes the things that made wrestling cool in the 90's and it also adds some elements from the fighting genre, the likes of Street Fighter. All of the graphics are wonderful, each of the wrestlers are very detailed and they come to the ring with their own entrances, lights and all. Each wrestler also has their own signature move, be it Haggar's Spinning Piledriver or Stingray's Jalapeno Comet. If you're a fan of the wrestling or fighting genre, or itching for a new experience in gaming, please give this one a play! Wrestling is an easy enough concept to understand. You try to pin your opponent for 3 seconds to win the match. However, this is an objective which will make this game a whole lot of fun. To be able to pin your opponent, you need to beat on him until his energy bar slowly drains down to nothing and then knock him down, afterwards attempting the 1-2-3. If you can do so, you win the match. However, if both opponents fail to score a pinfall in the time given in the match, the player who has the most health remaining is declared the winner. If both have the same amount of health in an occasion, then the match is considered a "draw." In a match, you will probably need to break out the whole arsenal of moves to win. Some moves consist of running. In order to run, you have to double tap either left or right to charge in the respective direction. Whether you bounce off of the ropes or hit your opponent, the directionals will lead you there. If you bounce off of the ropes, however, you gain another level of speed. Another technique that takes a little more time to master is the art of grappling. To be able to pull this move off, you must be standing next to your opponent and then hit the right and attack buttons. You can now either pull off either an Irish Whip (a throw at the ropes) or a body slam, depending on which button you press.